When I first started this blog two years ago (!!! 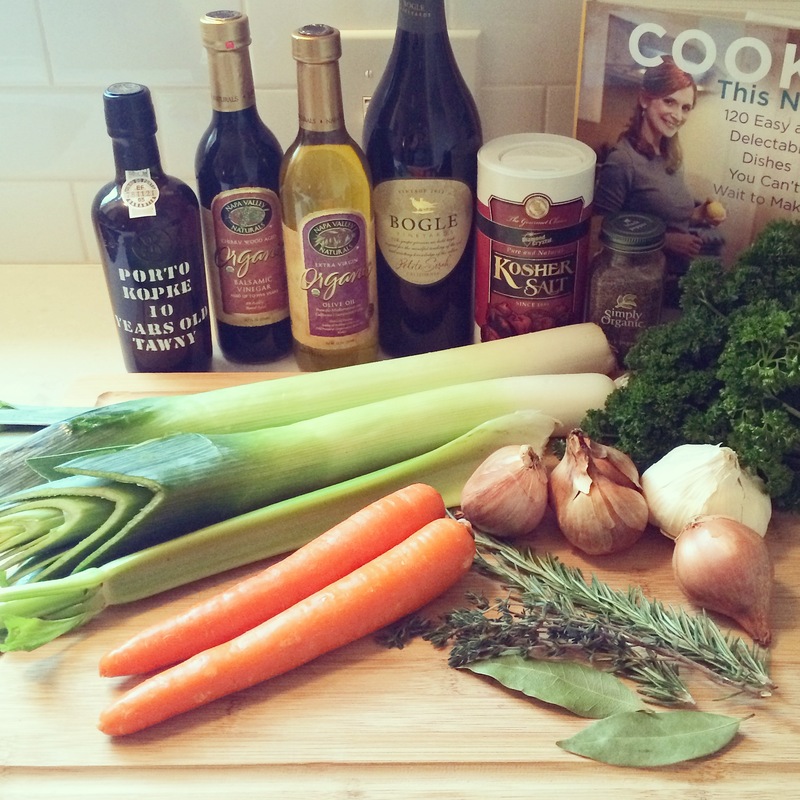 ), it felt like I was posting a Melissa Clark recipe every other week. I forced myself to take a break for awhile, so that I wouldn’t post every recipe she’s ever written, but tragically that meant that this, my most successful dinner party recipe to date, never made it onto the blog. Since I don’t eat red meat, I can’t tell you from personal experience how delicious these ribs may or may not be. However, I’ve made them a number of times now, and have passed on the recipe to family and friends, each time with rave reviews. Since I cook primarily for the accolades, I make these ribs a lot. This recipe comes from the January chapter of Cook This Now (Melissa organizes the recipes in this cookbook by month), so I had every intention of posting it two months ago. 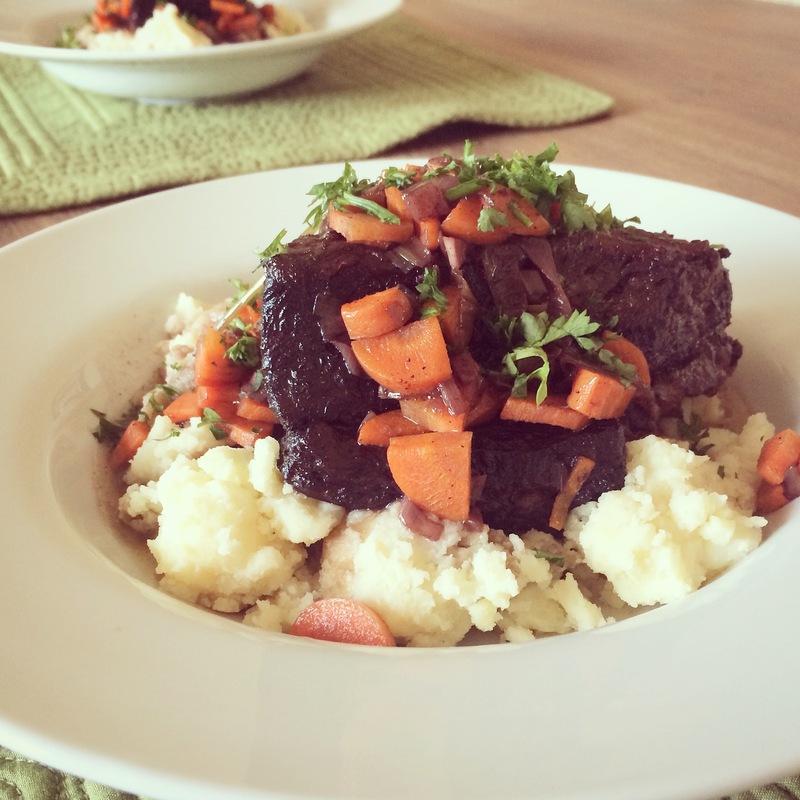 But as you may have noticed, Blueberries and Basil is off to a slow start this year, so my “January Short Ribs” are a little delayed – I hope you can forgive me. After all, most of the country is still experiencing January weather. And even in the Pacific Northwest, where it feels like May, it turns out short ribs are still well received even when it’s 50 degrees at dinner time. 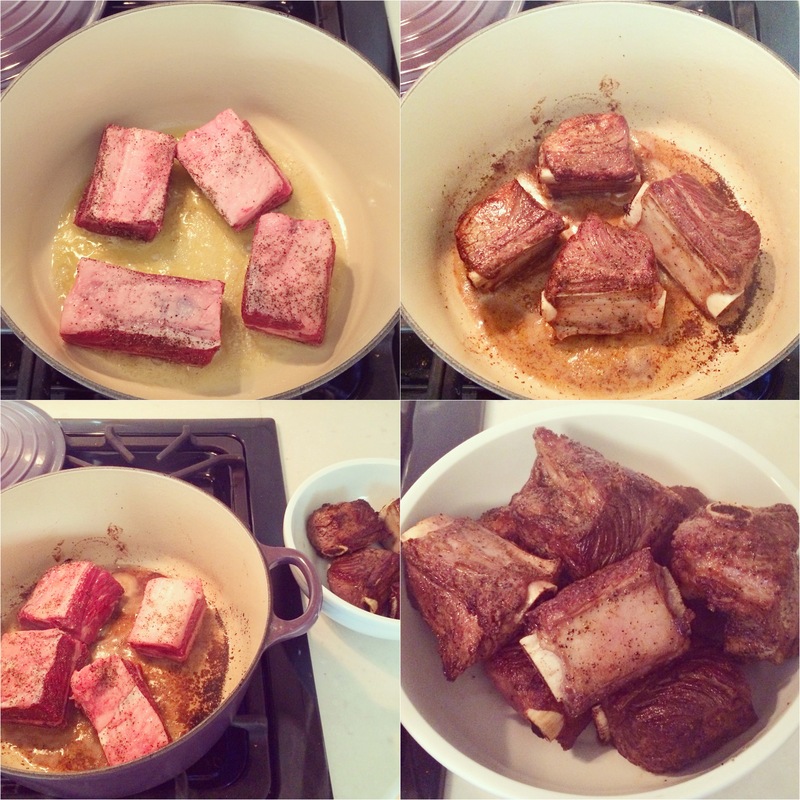 Many of you are probably familiar with how to braise short ribs – but I really wasn’t, so I was pleasantly surprised to discover how easy it is. it’s the perfect make-ahead meal (dinner party or otherwise) because you can prepare it in advance, pop it in the oven, and not give it a second thought for the next three hours. Simply reduce your port* and wine**, brown your meat, sauté your veggies, dump everything into your Dutch oven and bake (technically braise, I suppose) for three hours while you clean your kitchen, make dessert, take a nap, run errands – you get the idea. Three hours to do whatever you like while a delicious meal comes together in the oven, all on it’s own. 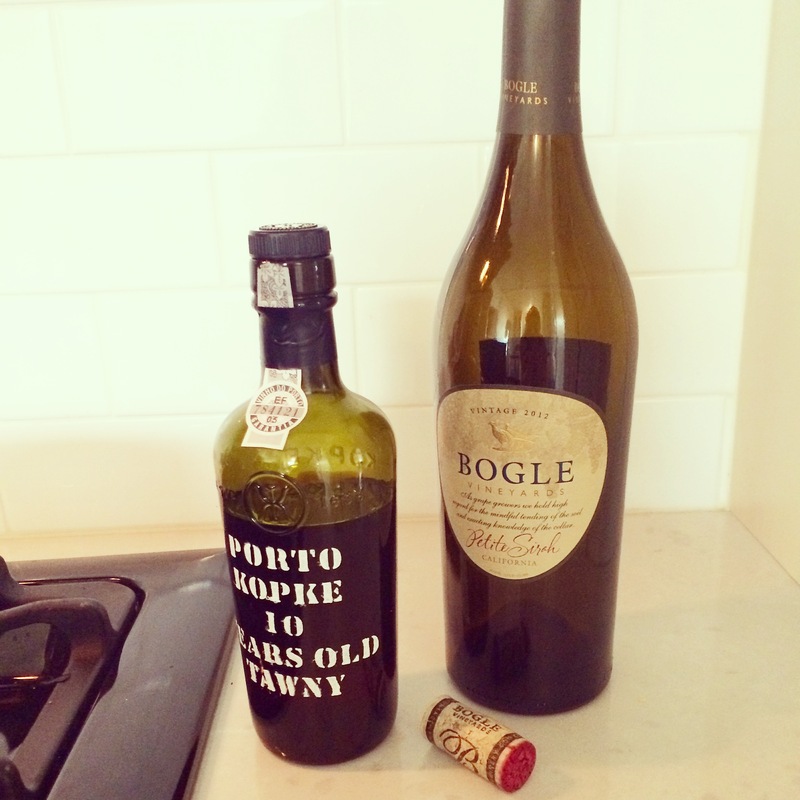 *Melissa uses port and wine, but if you don’t feel like buying a bottle of port only to use half a cup, I confess I’ve made them without the port before and haven’t heard any complaints. 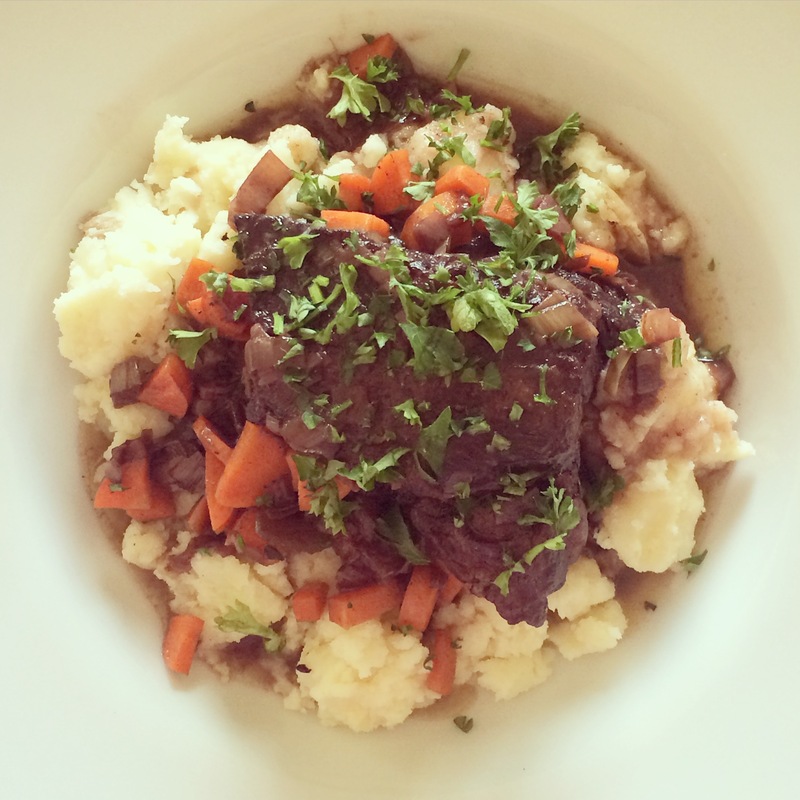 **The recipe calls for a dry red wine – I googled “dry red wine for short ribs” (because that’s the level of sophistication I have when it comes to using wine in cooking) and found most people recommend a petit syrah, so that’s what I’ve been using, but I think you could use whatever you have on hand. Meat usually grosses me out, but even I have to admit, they’re kind of pretty. And they make your kitchen smell amazing! The original recipe is technically for oxtails (speaking of being grossed out) rather than short ribs, so Melissa tells you the meat should be “almost” falling off the bone after two and a half hours. I’m assuming the rules for short ribs are different, as mine are usually actually falling off the bone after an hour or so. Again, I don’t eat them so I can’t say for certain, but I’m constantly asking people if they’re overdone and am assured they are perfect. But that said, if you needed to shorten the cooking time a bit I think you’d be ok. The beauty of braising, I’m learning, is that you really can’t go wrong. Bon appétit! 1. 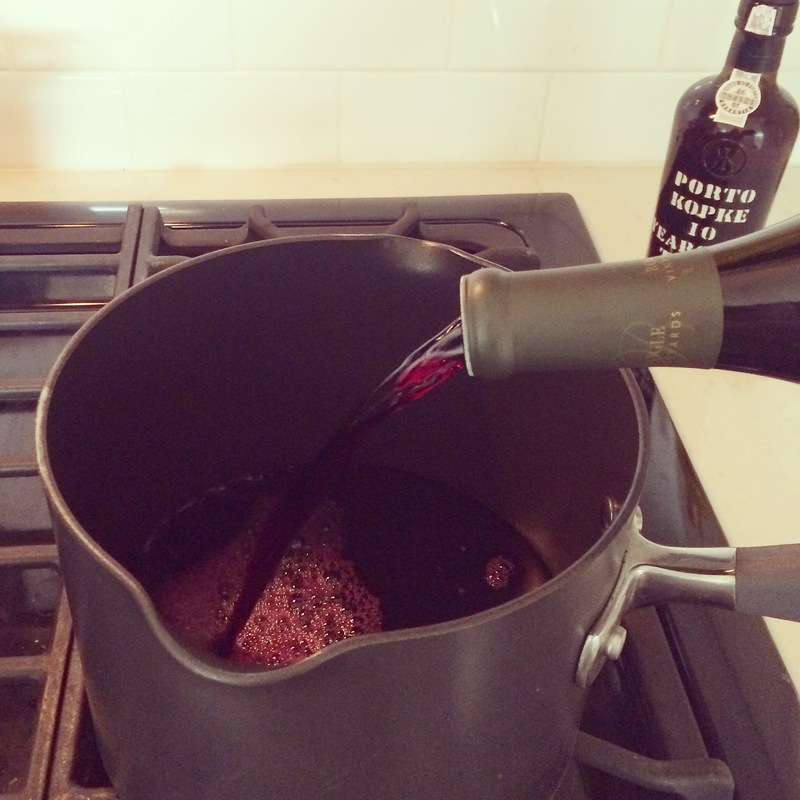 Preheat oven to 325 degrees F. In a large saucepan over high heat, bring the wine and port to a boil. Lower the heat and simmer until reduced by half, about 20 minutes. 2. 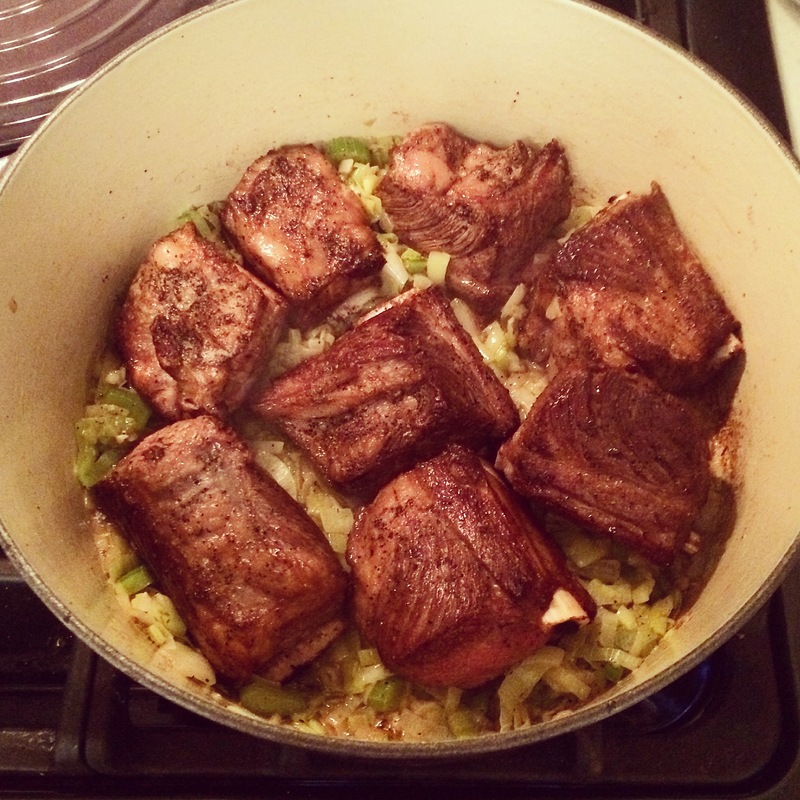 Meanwhile, brown the short ribs. Season them generously with salt and pepper (you will need at least two teaspoons salt and one teaspoon pepper, or possibly more – enough to get the meat well coated). In a large Dutch oven over medium-high heat, melt 1 tablespoon of the butter with the olive oil. 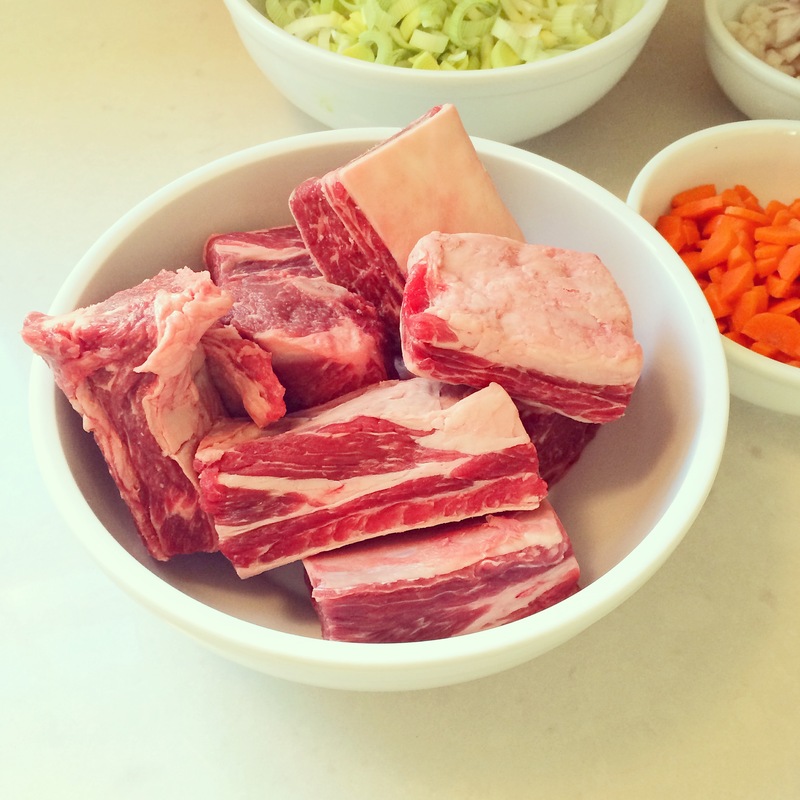 Working in batches, arrange the short ribs in a single layer and brown on all sides. Take your time with this and let them get good and brown; don’t crowd the pan, or they will steam and never develop that tasty caramelized crust. 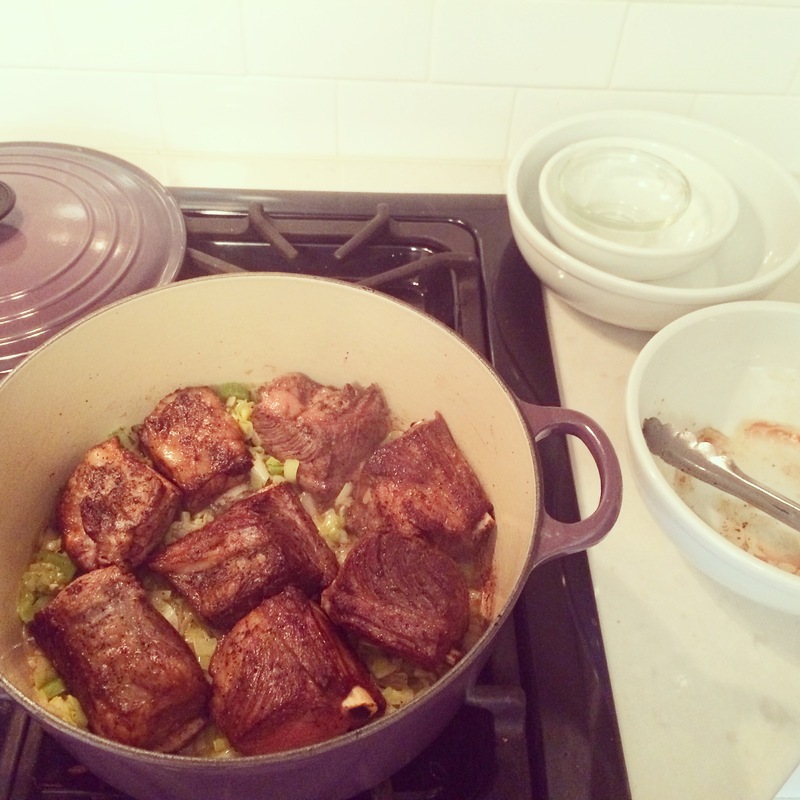 Transfer the short ribs to a bowl. 3. 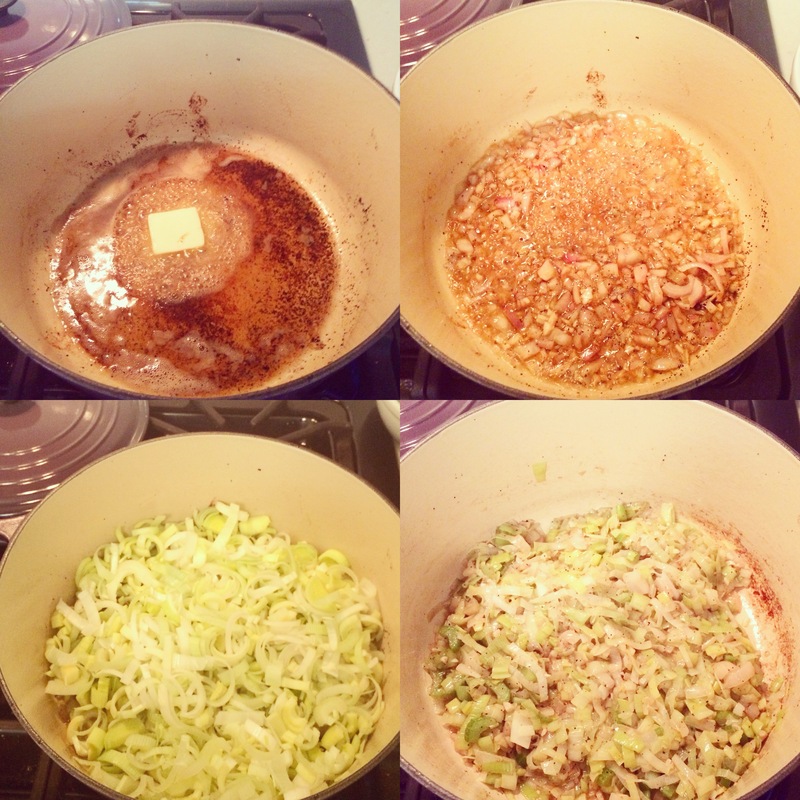 Melt the remaining tablespoon of butter in the Dutch oven and add the shallots, garlic, leeks, and celery. Cook the vegetables, scraping up the browned bits at the bottom of the pan, until softened, stirring constantly, about 5 minutes. 4. 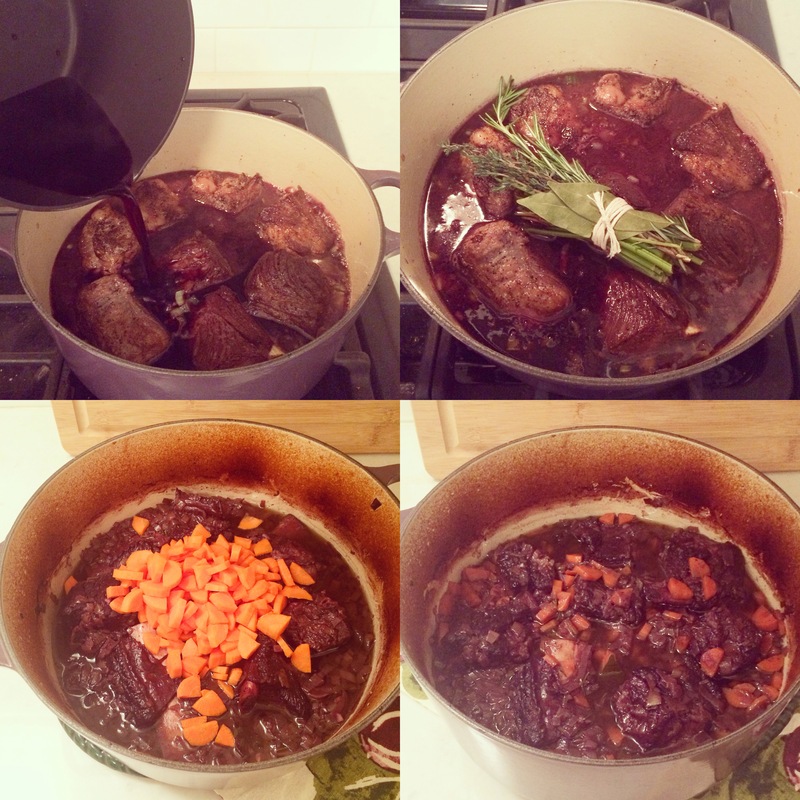 Arrange the short ribs over the vegetables and add the reduced wine-port mixture. Using kitchen twine, tie together the thyme, rosemary, parsley stems, and bay leaves, and drop into the pot. (You can skip the twine and simply drop the herbs into the pot if you don’t have kitchen twine on hand – although it’s a bit of a pain to fish them out before serving). Bring the liquid to a boil on the stovetop, then cover and transfer the Dutch oven to the oven. Cook, turning the ribs occasionally (or not), until the meat is tender but not yet falling off the bone, 2 to 2 1/2 hours (mine always seem to be falling off the bone by the two hour mark, but I give them 2 1/2 regardless if time allows). Add the carrots and cook another 30 minutes. 5. Season with balsamic vinegar and additional salt, if desired. Serve over mashed potatoes and top with parsley. *If you’re serving the short ribs right away, as I usually am, you can spoon some of the fat off of the surface if it looks a little greasy (mine never seem to). 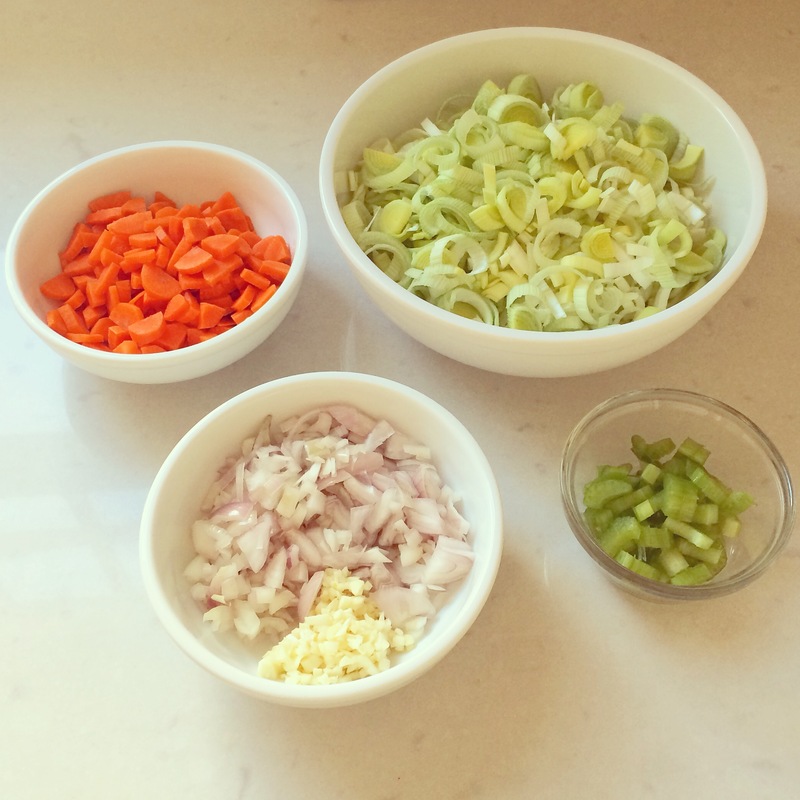 You can also refrigerate and serve the next day; in that case the fat is easy to scrape off – although you lose a lot of your vegetables with it. **In lieu of short ribs, you could use: 4 1/2 pounds oxtail pieces, 4 lamb foreshanks, 2-3 pounds brisket or chuck roast, or 2 pounds boneless beef stew meat. ***In lieu of mashed potatoes, you could serve over polenta, roasted potatoes, roasted root vegetables, or anything else that suits your fancy. You could also serve it on its own, as a simple stew. These look amazing! Going to try this recipe soon! You are such a nice friend to cook meat when you don’t eat it yourself! !